When it comes to talking about the town of Bhuntar, it paves a pathway to the towns of Kullu and Manali. You shall spot lush greenery all throughout and flora and fauna in plenty too. If you wanna traverse to Kullu, it is around 10 km away from Bhuntar. Located in the Kullu district of Himachal Pradesh, some other significant tourist places of attraction include the Jagannath Temple and another temple by the name of Bijili Mahadev temple. Bajaura Village is yet another famous place which people love travelling to. 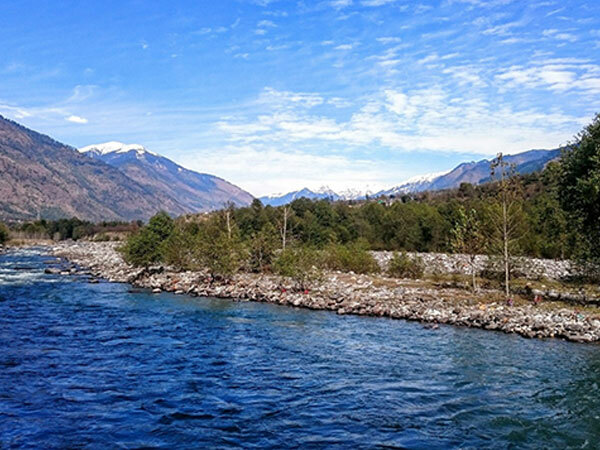 Did you know that the popular river Beas also flows via Bhuntar? How is that significant, might be your question? Well, it opens the door to great enjoyment for you via White Water Rafting. During the summers, a camping site near the town serves as a nice relaxation point. Basheshwar Temple in Bhuntar is also a people's favourite. By Air: You shall be glad to know that it has its own domestic airport known as Bhuntar Airport or Kullu Manali Airport. It is well connected to a lot of major cities like Chandigarh, Dharamshala, New Delhi and Shimla. But the airport is currently not providing service. Nearest shall be Bhuntur Airport, Kullu. By Rail: Can you guess the nearest railway station to Bhuntar? Pathankot. It is actually a junction and its network is spread across North India. It is nicely joined to a lot of major cities like Mumbai, New Delhi, Jaipur, Jammu, Ahmedabad and Lucknow by a couple of expresses, such as Hatai-Muri Link Express, Himsagar Express, Sealdah-Jammu Tawi Express, Jhelum Express and Jammu-Tawi-Ahmedabad Express. By Road: It is connected properly to major cities like Chandigarh, Punjab, Haryana and Jammu through Himachal Pradesh State Board Transport Corporation(HPSRTC) and few other private travel services as well. It is 11 km from Kullu, 50 km from Manali, 60 km from a place called Mandi, 105 km from Rampur, 195 km from Shimla and 210 km from Baddi. It is famous by yet another name known as the Visveshwara Mahadev Temple. It is an extraordinary temple which is well-known for its stone carvings, flat Shikaras and wondrous sculptures. You shall have no trouble visiting it as it is only 4 km away from Bhuntar Airport. The 8th century saw the emergence of this magnificent temple and it is the largest of all the temples in Kullu. This heavenly abode of Goddess Bhuvaneshwari is just 3 km away from Bhuntar on a hill. Would you believe that it is on an elevation of 5000 ft above sea level? You can merrily trek your way to the temple and a mesmerizing view of Kullu town can be admired from the hill. Be careful as the way to the temple is deemed to be pretty steep! This temple is quite close to Bhuntar, on the Mathan Hill and again at a breath-taking altitude of about 2000 m. The temple is built in the Kash style and is totally devoted to Lord Shiva. There is a saying which you can decide to believe or not to believe! People say that whenever you come across a flash of light, you shall find the Shivling break into pieces. Also, the devotees loyally believe that their sincere prayers can result in rainfall and the land shall become good enough for cultivation purpose. Well, it is a possibility that some of you recognize this park by the name of Jawaharlal Nehru Great Indian National Park. It is spread over a huge area and is present in the locality of Bhuntar in Kullu. Your eyes shall meet the sight of a lot of glorious snow-capped peaks, alpine meadows covered with flowers, gorgeous glaciers as well as coniferous forests. It is also a means of shelter for a variety of animals like brown bears, black bears, rhesus macaques, langurs, wild sheep as well as the Himalayan musk deer. At a distance of about 4 km from Bhuntar, Adi Brahma Temple is a gigantic wooden temple located in the Khokhan Village. It has a huge statue of Lord Brahma present in the centre of the temple premises. There is a chariot in the temple which comprises eleven silver as well as two brass mohras and even an Astadhatu shall delight you. Can you guess where this place is located? Well, quite close to Bhuntar, in the district of Kullu. Tourists usually love to traverse this place, thanks to its deodar trees and meadows and also because it serves as a merry picnic spot.